Last year I shared my tips for finding an OOP fabric. Today I want to address the opposite issue, destashing. Destashing is selling, swapping or donating fabric that you don't want any longer. 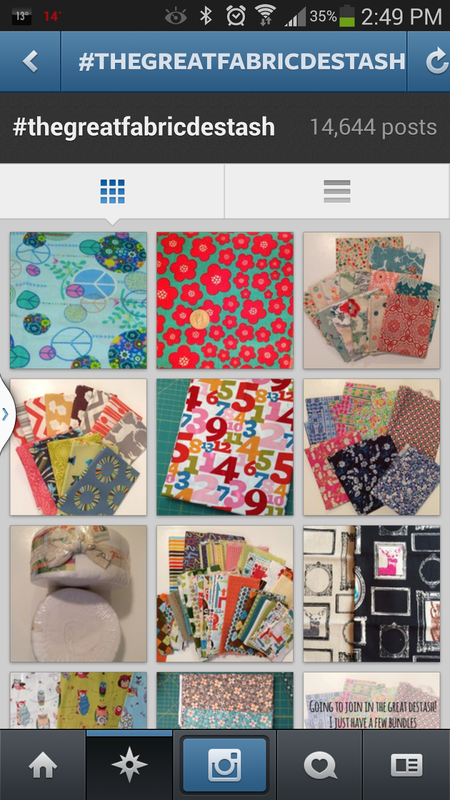 A few weeks ago #thegreatfabricdestash began on Instagram. Sellers post a photo of the fabric they want to sell including pertinent info and price. Buyers leave their paypal email to send an invoice to and the transaction then goes on to finish. There are over 14,000 photos on instagram with this hashtag so it has become quite popular for selling. (and buying) If a seller has a lot to sell often they set up a separate instagram identity just for selling. If you would like to swap you can list that in the details and solicit a swap rather than a sale or if you are open to either. Etsy & Ebay: people have been using these outlets with success for years. It is important to list all the details of what your selling to make it easy for buyers to find. For very hard to find fabrics, I like to sell on Ebay. I feel guilty price gouging but also hate to leave money on the table...with Ebay the market decides the price. Flickr: You can't sell fabric on flickr, but there are many swap groups so perhaps you can trade it away for something else you might like. Guild or Quilt Store garage sale: If your guild or local quilt shop have garage sales this is an excellent opportunity to sell a lot at one time if you don't want to mess with shipping. If you have something highly sought after though, this might not be the best way to maximize your dollar but perhaps better if you just have a lot to sell and you want to move it. Often there is a small fee to buy table space at these events. Donations: Donations can take the form of making pillowcases or bags for a charitable entity and then donating them, donating fabric to church or quilts of valor groups OR just taking your fabric to a thrift store. Be sure to get a donation receipt if available if that would be tax advantageous for you. If you have any other options that have worked for you, let us know! Thanks for sharing! Didn't know about the destash hash tag on IG! We have mentioned this at meetings, but Quilts of Valor, (at least one local branch) also accepts donations of any size or color of quality fabric.